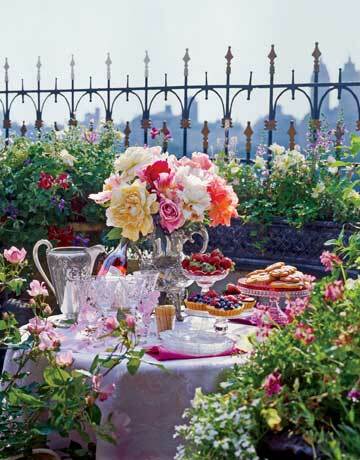 When the weather’s bordering on insanely hot, there’s no better way to spend a Monday than to pop round to a mate’s house for a good old gossip in the garden, idly rocking back and forth on a swing seat with an ice-cold drink in one hand and a plate full of mini-cakes in the other. Between the three of us we managed to cover almost every topic under the sun during the afternoon, with plenty of giggles along the way. For the past fortnight I’ve been working 6 days a week, so the fact that this is a Bank Holiday weekend is very welcome indeed. It’s been busy in the office, and also exciting with the arrival of my brand new computer with shiny new keyboard and mouse along with two great big monitors, but nice surprises aside it’s actually a welcome relief to finally be able to spend a couple of days in my much-neglected garden. In my absence, however, Mother Nature has decided to spoil me, and when I stepped outside this fine, sunny morning I was greeted by the sight of dozens of bright orange Californian poppies, stunning giant red ornamental poppies and delicate blue love-in-the-mist. It appears that many of last years plants have self-seeded, and the mixed wild-flower seeds I randomly scattered at the end of last summer are now flourishing. Well, it’s been a couple of weeks since I moved into my own office and I’ve been busy settling into my new routine. It’s certainly a steep learning curve, and there’s plenty more things I’ll need to get to grips with in the next few months, but so far so good. Obviously, when I’m not at meetings or dealing with enquiries I’m attempting to replicate Kew Gardens in a very limited space, much the the bemusement of visitors and colleagues alike. I’ve so far managed to fill the windowsills and have been moving stuff around to create some brand new areas where I can pop a bit of foliage and a few blooms to create a beautiful and positive working environment. It may just be a ‘workplace’ but in my opinion, whenever it’s possible (and practical) it’s important to make the space your own, and my ‘own’ very much involves flowers. When you have a day off work, it’s really nice if you can spend your precious spare time with your mates. It’s even more fabulous if there’s copious amounts of lemonade, yummy cream cakes and delicious home-made scones involved; along with general chit-chat and some decent laughs thrown in for good measure.